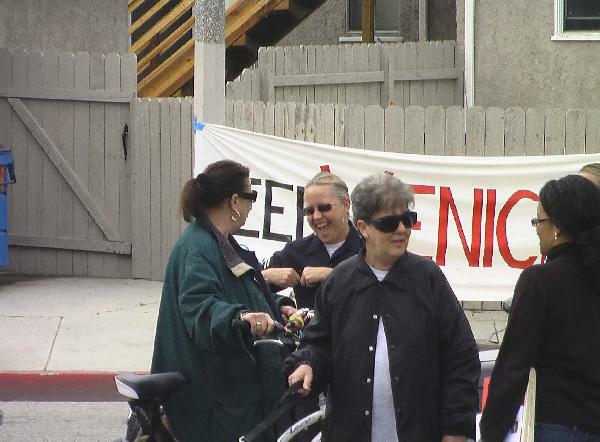 Next the Venice NIMBYs Vote to Exterminate Homeless People? Big Election in Venice is Biggest Fiasco! The Venice Neighborhood Council (VNC) held an election Saturday, February 21 at the Venice Abbot Kinney library and, according to Michael Linder, it was the “Best fledgling democracy this side of Baghdad.” The election and the ballot counts consisted of more irregularities ever seen before in Venice and maybe the world. The VNC web site claims that the vote is now certified (cheers for them, hooray, the homeless haters won again), but exactly when do the two people who conduct an election - unseal the ballot box at the polling place to start the vote count, then put ballots in three smaller flimsy boxes, take these boxes full of ballots to their home, actually be the only two people who conduct the final ballot count the next day, and also be the same people who officially certify the election results? I am not kidding. I videotaped it. OK, lets start this story near the beginning. The Overnight Permit Parking District law or OPD law, LAMC 80.54, is a law put through City Council in 2005 by Bill Rosendahl, the Councilman for the 11th District, and it is specifically being used to remove those living in vehicles from affluent areas. The Venice Neighborhood Council, whose president is a real estate Attorney and most board members are white homeowners, supports the OPDs. The election stimulus (no federal money involved) for this Venice Neighborhood Council vote was an initiative petition, a provision of the VNC bylaws, which was submitted by someone named Mark Lipman on December 16 - without any real forethought on who the opposition was here. The language of his initiative was meant to rescind the Neighborhood Council’s support of Overnight Permit Parking Districts (OPDs) in Venice, but some people felt that only a lawyer could understand it. Subsequent to Lipman’s initiative petition, Mark Ryavec and Stewart Oscars, both well known for Venice Neighborhood Council involvement and for supporting criminialzation of homeless people, submitted an equally confusing opposing initiative petition the following month stating that permit parking is a Right. As a reader of the U.S. Constitution Bill of Rights and the U.N. Declaration of Human Rights (which I highly recommend people read), I simply do not remember overnight permit parking on either document. Nonetheless, the Ryavec/Oscars initiative states that it is a right to have permit parking and a well-funded campaign based on fear, hate, and the pretense that permit parking is a public safety issue ensued up through the election day. A group calling itself the Venice Stakeholders Association, which Mark Ryavec admits to be part of, paid almost ,000 for Argonaut newspaper ads in favor of overnight permit parking. The Argonaut is a Marina Del Rey paper that, until recently, is packed with real estate advertisements. This advertisement was written as if an open letter to Venice residents and signed by Georgann Abraham, co-chair of the [pro] OPD committee of the Venice Neighborhood Council, who was seen sporting around Venice in a very hot looking burgundy Carrera 4 Porsche on the election weekend. Two more ¾ page ads appeared in the February 19Argonaut; one stating that “Those who live in RVs and vans have proposed an initiative to deprive [the real Venice residents of] their right…” and the other was a reprint of the nasty hate ad one signed by Georgann Abraham. I am guessing some big money is behind this Venice Stakeholders Association, who also hired an expensive lawyer to help them at the Coastal Commission on this issue. Well, the election process, itself, was very poorly planned. Only three hours was provided to vote? The person apparently running the election was unable to maintain any real decorum. People were given multiple ballots to vote with. The ballot box was opened and the ballots went home with someone prior to any vote count. *	The LAPD blocked the entrance to the election location by parking their vehicles in front of the entrance of the library and people thought they could go into the lot. No sign was put up telling people to pull around the police car to drop off disabled or seniors. 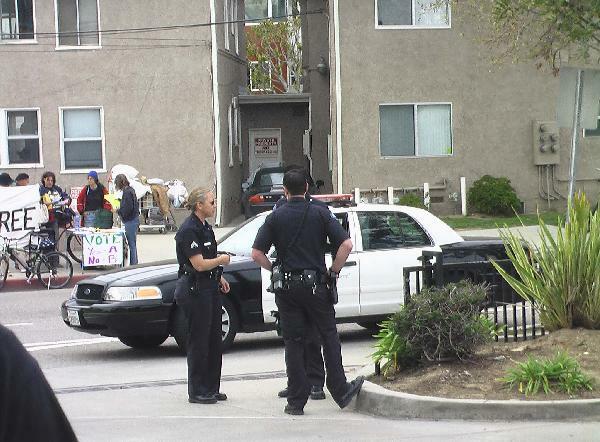 *	LAPD officers milled around the election entrance throughout most of the election. *	People felt intimidated by the police presence and did not go vote at all. 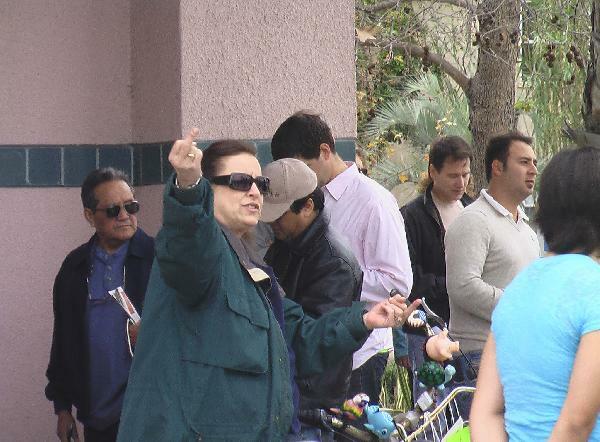 *	A long-time Venice Neighborhood Watch person called Boston Dwana was spewing fowl language, flipping the bird, and threatening people documenting the election on video tape (also seen hugging the LAPD). *	The line was so long, people who knew they could not physically stand in line for hours simply did not try to vote. *	There was no absentee voting process. *	Ivan Siegel, the person running the election, was yelling at people and some left without voting. *	Ivan Siegel, yelled at person for having VNC registration forms and tried to pull them out that person’s hands – when the form is downloadable from the VNC website and others were allowed to go up and down the election line with the same form registering people. *	A person voting, who qualified as a Venice stakeholder under VNC bylaws, had his or her registration form marked as “Non-Resident” by a (rightwing Cuban) polling volunteer. *	The place voter marked their ballots during the election, was a small table where groups of people were allowed to mark their ballots together, talk among themselves, and consult each other how to vote. *	Someone honest reported being given 3 ballots inside the polling place. *	A VNC board officer harassed someone talking to friends in line, accusing him or her of electioneering, while a man was passing out a bright purple pro-OPD flyer to most of the election line right in front of him. *	A VNC walking man flyer stating the actual ballot initiatives should have been distributed to Venice addresses. Most people who voted were informed by flyers or emails distributed by the initiative proponents or advertisements. *	The VNC election committee decided the votes would be counted on the same day as the election and the count took place in a meeting that was not given sufficient public notice. *	No one should have taken the ballots home, especially after unsealing the ballot box. *	The vote count and certification is not legal by any standards. The vote count is a noteworthy part of the VNC election fiasco. At the polling place, a decision was made by Ivan Siegel to begin the count at the library – even though the actual voting ended around 5pm and the library closed at 6pm. (If you were in the line to vote by 3:30, you could still vote and that is how long it took to finish.) There were multiple witnesses in the room. An initial one-time count of the total ballots was made and a number of 1504 total ballots was provided. Siegel then decided that there was not enough time to count the vote around 5:45 (duh!). Most of the witnesses demanded that the votes be counted and people started to yell and fight. One person, who made some sense, suggested that the ballots be picked up by a Brinks document service. After a very crazy exchange of screaming and arguing back and forth, a decision was made by Siegel to meet at the Extra Space Storage on Venice Bl at 11am the next morning and Elizabeth Wright, the other person on the VNC election committee and the person who was supposed to be working with Siegel to manage the election, took the ballots home – flimsy boxes an all - in her minivan! On Sunday, February 22, the Wright minivan pulled up to Extra Space Storage with the overnight ballot guests. The count took place in a small, hot room filled with homeless haters. There were three tables of two counters and one witness each. Wright was witness on and off on one of the counting tables. Two of tables had witnesses that participated fully in the tally process of the counts. They did not maintain their witness status at all. After hours of unreasonable temperatures in the Extra Space Storage room that no one could legally be forced to work in because the heater had been left on, and many confusing recounts of tallies, each table provided Siegel with their tally sheets. Then most of the counters and the so-called witnesses left. Siegel added up the tally sheets (by hand), but found out that they were more than 300 ballots shy of the 1504 count from the night before. Siegel and Wright then decided to count the votes themselves! Siegel and Wright, the people who ran the election and members of the VNC election committee, then counted the votes, tallied the votes by hand (no calculator), found the over 300 missing votes plus 6 more, and Siegel announced that he certified the election. Wow. 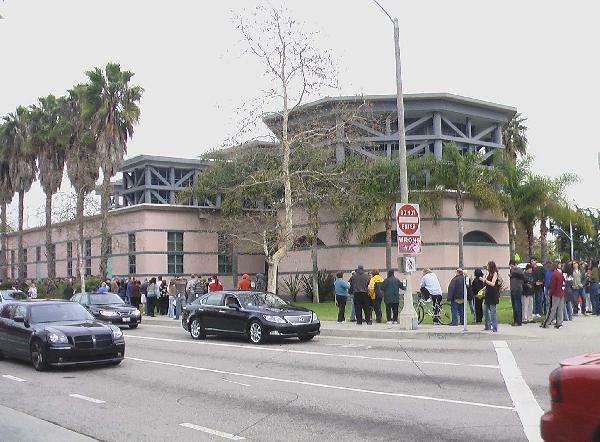 Despite all of the cheating, the misconduct, the police blocking the entrance of the polling place, the fear campaign waged by homeless haters, confusing ballot initiatives, and the lines that no working or disabled person could possible wait in – the vote in favor of the anti-homeless Overnight Parking Districts still only came out to a 57% lead. Rosendahl, himself, insists that each block will require a 66% approval to get the permit parking put in. All in all a deeply flawed election. So what next? The Venice NIMBYs vote to exterminate the homeless people? Boston Dwana flipping us the bird for filming the election. And blocking the entrance to the election.